Read Our Guide to Get All the Gabriel Batistuta Facts You Could Ever Need! Powerful. Clinical. Unplayable. Those are some of the adjectives that opposing defenders used to describe Argentinian soccer player Gabriel Batistuta. Labeled by countryman Diego Maradona as the best striker he’s ever seen, the man affectionately nicknamed Batigol unleashed his ferocious brand of soccer on opponents for more than 18 seasons. However, if it were not for a magical moment in the summer of 1978, the world may have never been given the opportunity to see the decorated talisman lace his boots. Batistuta was born in Reconquista, Argentina. As a youth, he preferred sports other than soccer. He was tall for his age and particularly enjoyed basketball. He had very little interest in what would become his future profession until 1978. That summer, Argentina hosted the World Cup. Batistuta was captivated as he watched La Albiceleste overcame difficult odds to win the tournament. From that moment, he decided to pursue the sport and joined a local club with some of his friends. Batistuta’s early performances showed him to be a raw talent, possessing very little technical ability. Nonetheless, Newell’s Old Boys believed that he would be a special player and offered him a professional contract. Batistuta’s professional career got off to a slow start. After a disappointing season with Newell’s, he transferred to River Plate. There, his struggles continued as he managed to find the back of the net just 3 times in 19 appearances. Things began to gel for Batistuta in his next stop with Boca Juniors. The club made him the focal point of its attack and he responded by scoring 13 goals and helping Boca win the league championship. His impressive form earned a transfer to Italian club Fiorentina. Batistuta’s performances with La Viola would cement his legacy as one of the greatest players to ever grace the pitch. Who Did Gabriel Batistuta Play For? In all competitions with Fiorentina, Batistuta scored a total of 207 goals in 333 appearances—a blistering .62 goals per appearance. In addition, he scored a league-leading 26 goals in 1995 and helped Fiorentina win the Coppa Italia and Supercoppa in 1996. Watch: Video of Some of Batistuta’s Best Goals With Fiorentina! Unfortunately, he was unable to win the Scudetto with La Viola and after nine years with the club, he was sold to Serie A rival Roma. Having gone 18 seasons since it last conquered Italy’s top league, Roma was desperate to win the Scudetto. So much so, it was willing to pay what is still the largest transfer fee for a player over 30 years old. The transaction was a stroke of genius as Batigol lived up to his name. He scored 20 goals in 28 appearances, helping Roma end its dry spell and win the Scudetto in his first season with the club. Batistuta would spend two more seasons with Roma before moving on to Inter Milan and then ending his career with Qatari-based club Al-Arabi. He currently ranks as Fiorentina’s top all-time goal scorer, 12th on the list of all-time goal scorers in the history of Serie A, and boasts the 4th highest ratio of goals-per-appearance in Serie A at .58. Did Gabriel Batistuta Ever Win the World Cup? Batistuta was as prolific for Argentina as he was for his club teams. He was first selected to play for La Albiceleste in 1991 for the Copa America held in Chile. His debut was nothing short of spectacular as he finished with a tournament-leading six goals and helped Argentina secure its 13th title. His next Copa America performance in 1993 offered more of the same as he scored Argentina’s only two goals in its 2-1 victory over Mexico in the final, giving Argentina its 14th title. While Batistuta was just as deadly in the three World Cups he played, La Albiceleste was unable to duplicate the success it had in Copa America. In the 1994 World Cup, the morale of the team took a huge blow after Diego Maradona was suspended for a drug violation. La Albiceleste subsequently bowed out in the round of 16. 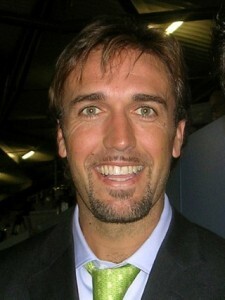 In the 1998 World Cup, Batistuta recorded his second hat-trick in the international competition, making him the only player ever to achieve this feat. However, it was not enough as Argentina was knocked out by the Netherlands in the quarterfinals. Batistuta announced that the 2002 World Cup would be his last international competition, providing Argentina with an emotional boost. Going into the tournament, the team felt very good about its chances to win. Once again, it came up short. Finding itself in the “group of death”, La Albiceleste was knocked out of the tournament in the opening round for the first time since 1962. Batistuta finished his international career with a record 56 goals in just 78 appearances—a number that may never be surpassed.